Morton was 22 when he became town manager. While in college at the University of Maine Portland/Gorham — now University of Southern Maine — he was hired to work for the town of Gorham. “I worked in the assessor’s office, the code office, the accounting office, public safety, so I had the opportunity to gain some experience,” he said. As graduation loomed, Morton sent out job applications. He was hired in Casco in February 1978 before graduating. He was Casco’s second town manager. The first left after six months. Morton stayed. It wasn’t an easy start. At his first town meeting, residents were discussing building a new fire station, which was controversial. “I didn’t really know any of these people, and I’m 22 years old, and I’m sitting there saying ‘What have I gotten myself into?’” he said. The community was very welcoming, Morton said, and he loved how the residents of Casco helped each other. He remembers an elderly woman who was ill and whose home burned in a fire. “The town got together and built her a house. Hancock Lumber donated materials. Skilled folks — plumbers, electricians, carpenters — all got together,” he said. Morton also serves as Casco’s road commissioner. When he first started working in town, his duties were more far-reaching. “I actually vacuumed and cleaned up the office at the end of the day, and if there were dead animals in the road, I had to go out and pick those up,” he explained. Over the years, Morton has witnessed a variety of changes. The town, with a population of 3,902, now has a recycling facility and a household waste transfer station, but in his early days as manager it had a burning dump. And, “when I first started, all the work was done on a white Underwood typewriter on the table,” he said. Morton said his goals as manager have been to genuinely try to help people and to be patient. “People come in that might be angry or frustrated. There’s a reason behind that, and you need to be patient and hear what they have to say,” he said. Over the years, Morton considered town manager positions in other locations for their bigger paychecks. “I came to the conclusion that I had a job here in Casco that I could do and do well, that I enjoyed, in an area where I wanted to live, with people that I liked, and so even if I wasn’t getting the larger wages, those factors all outweighed that,” he said. One of his favorite aspects of the job is the people he has worked with, and he spoke highly of the Selectboard. “They’re very positive, they like to focus on getting things done in the community and they disagree well. They’re not afraid to speak in opposition to something, and they may speak very strongly in discussions about any particular topic, but once that’s over, they move on to the next item,” he explained. Selectboard Chairwoman Holly Hancock praised Morton as well. “He’s very concerned about the people in Casco and wants to do what’s right for them. He’s been a great manager for the town,” she said. Residents feel the same way. “The town is really going to miss Dave. It’s like trying to replace Bill Belichick,” said Morton’s neighbor, Larry Dyer. Morton was born in Gorham, grew up in Windham, and lived in Windham when he and his wife were first married. The Mortons moved to Casco in 1978. “I’ve never gone very far. I don’t think I’d live anywhere but Maine,” he said. An avid sportsman, Morton is looking forward to spending more time outside after he retires. “I love to fish, I love to hunt, I like cross country skiing, I like snowshoeing. All of those are right out the door here, literally,” he said. He has been considering retiring for a few years and, after discussions with his wife, felt it was a good time. “I have a great staff. All the folks here know their job, they do it well. It’s a great Selectboard. I can leave comfortably knowing things will go well,” he explained. Morton’s 41-year streak in Casco is the longest stay in a single community out of all members of the Maine Town, City and County Management Association. The town manager of Monmouth has been a manager for 42 years, but not continuously in the same town. Morton has held his position for so long that the Selectboard doesn’t have experience in hiring a manager. Residents at town meetings haven’t provided much input, either, Hanock said. David Barrett, the director of personnel services and labor relations for the Maine Municipal Association, will assist with the search. The Selectboard is reviewing manager job descriptions from other towns and will write its own in January. Then, Hancock said, the position will be advertised for about a month. The board will then set up interviews. Morton said he has faith in the Selectboard. He advised the new manager to maintain close relationships with neighboring communities, as he has, and to incorporate changes gradually. 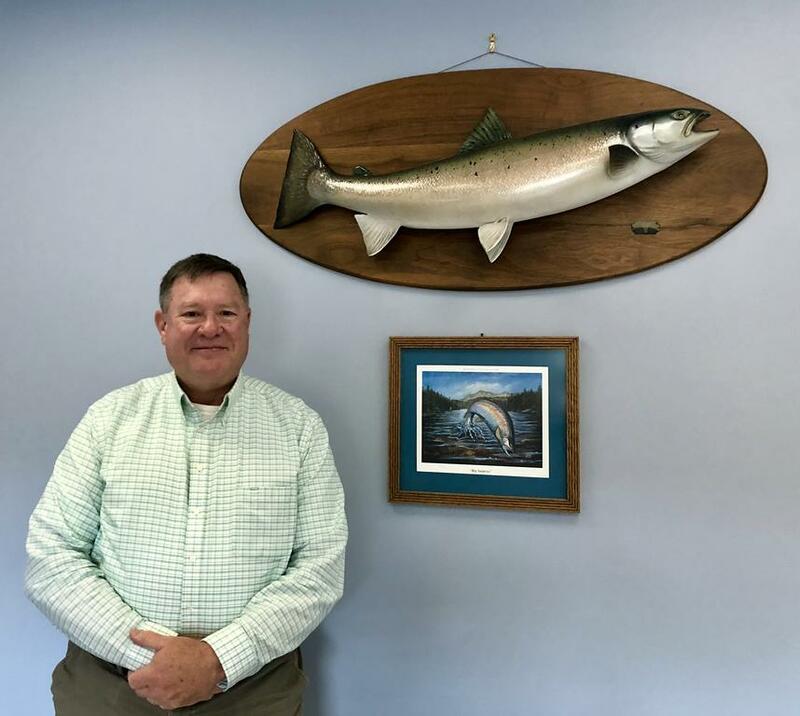 Casco Town Manager Dave Morton will be retiring in June 2019 and as a sportsman, looks forward to spending more time outdoors.